"Compound interest is the eighth wonder of the world." "My wealth has come from a combination of living in America, some lucky genes, and compound interest." Compound interest is an extraordinarily powerful financial tool, and reinvesting the cash flows received from investments has historically been the single most reliable way of building wealth over the long term. For many people, understanding the power of compound interest is the very heart of financial literacy. Compound interest is the reason why people are urged to begin investing for retirement in their 20s and 30s, because having an extra decade or two for interest earnings on interest earnings to work their magic creates a wealth building machine, and far larger savings than would be amassed by someone starting in their 40s or 50s. However, compound interest is not a constant - it is not always of equal power and it is not always available. The near zero percent interest rates of the decade since the financial crisis of 2008 essentially wiped out the historical norm of individual investors being able to create wealth by simply reinvesting their interest payments again and again over the years. 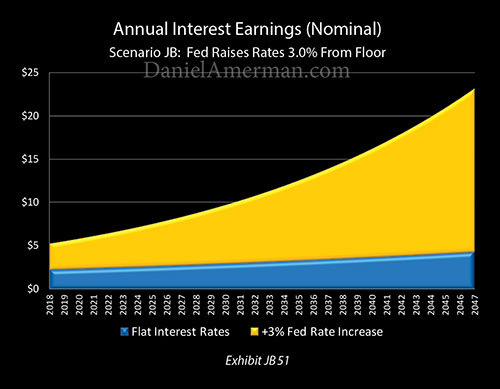 The times have been changing recently, however, and the Federal Reserve is currently rapidly increasing interest rates. As explored in this analysis, if the Fed carries through with its planned interest rate increases through the year 2020 and then keeps rates at that new level - it will be sufficient to cause the return of a wealth creation "miracle" for every saver and investor in the nation. The graph above represents interest earnings for a $100 investment over 30 years. The blue area is where we were with bottomed out interest rates over most of the last ten years. The gold area shows the explosion in wealth for the average saver that will return if the Fed carries through with raising rates and keeps them there. The sharp upward tilt in the top of the gold area as it pulls away from the blue area with increasing speed - is the return of what Einstein and Buffet were talking about. It is the near miraculous power of compound interest. However, the future is not like the past. The United States government is over $20 trillion in debt, and it cannot pay the interest on that debt without borrowing the money. The higher that rates go - the higher the deficits go and the higher the debt goes, as the nation as a whole experiences the flip side of compound interest. As we will explore, there is fundamental conflict of interest between our personal ability to build wealth and the size of the national debt. This conflict did not exist at lower debt levels, but it exists now, and it could be one of the single most important determinants of our personal future financial security and standard of living. Because the level of interest rates is important for all of the major investment categories, this means that the conflict explored herein could also be a key determinant of the future paths of stock prices, real estate prices and precious metals prices. There are further implications when it comes to financial planning and the allocations between different asset categories. This analysis is part of a series of related analyses, an overview of the rest of the series is linked here. In this exploration, we will isolate the impact of rising interest rates on both average savers and on the federal government. We will assume that an investor is making very safe investments in a mixture of short, medium and long term instruments that produce an average yield that is equal to the average interest rate paid on the federal debt. As covered in the Part 1 analysis linked here, that is about 2.25%. As described in more detail in the Part 1 analysis, the Federal Reserve is currently discussing interest rates by a total of 3% from their floor. This number is not fixed, and it does bounce up and down, but we will assume that savers will be able to invest at a 3% higher rate, meaning they can earn a 5.25% interest rate, and that over time the average interest rate paid on the federal debt will also rise to 5.25%. Someone who invests $100 at 2.25% earns $2.25 in their first year, as can be seen in the "Flat Rates" column above. This gives them a bigger investment for the second year - $102.25 - and when that is invested at 2.25%, they earn $2.30. That is five cents more than the first year, and represents interest earnings on interest earnings - otherwise known as compound interest. By the tenth year, the interest earnings on interest earnings are up 50 cents a year, and total interest earnings for that year are up to $2.75. 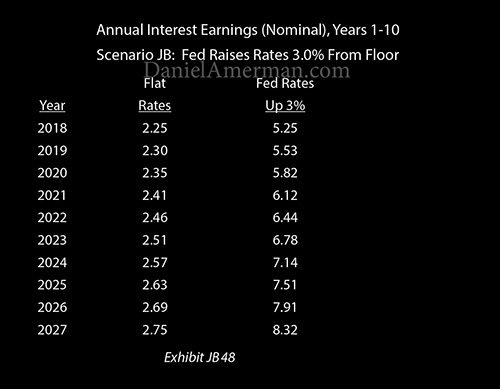 Now, if the Fed does carry through with raising interest rates by 3% and keeps them up there, then the first year interest earnings on a $100 investment are $5.25, as can be seen in the "Fed Rates Up 3%" column. That is 2.3X greater than the interest earnings at 2.25%. By the tenth year, the interest on interest earnings with a 3% rate increase is up to $3.07 ($8.32 - $5.25). So, the interest rate is only 2.3X as great, but the compound interest in ten years is worth more than 6X as much as it would be with flat rates ($3.07/$0.50). This is the very heart of the "miracle" of compound interest, but to get it - you need "fuel" in the form of higher interest rates. This same mathematical relationship applies to the deficits that are run by the U.S. government. As covered in the Part 1 analysis, the macroeconomic model that generates the numbers above has many other factors, but all factors are identical between the two columns except for one - interest rates. If the Fed sticks with its plans to increase interest rates by a full 3%, then the first year impact is to increase the deficit from $798 billion to $834 billion, an increase of $36 billion. As discussed in the Part 1 analysis, because it takes on average almost six years for the U.S. debt to reprice at higher interest rates, the impact in the first year is relatively small (if $36 billion can be called "small"). However, if the only change we make is the Fed increasing interest rates by 3%, then the deficit in 2027 would be $1.928 trillion instead, which is an increase of $1.13 trillion ($1,928 - $798). So the same 3% increase in interest rates that creates a 6X increase in interest on interest earnings for an individual investors in ten years, also creates a 2.3X increase in annual federal deficits, bringing them to almost $2 trillion per year. The exact same interest rate increase that investors badly need - multiplies the problems for a heavily indebted federal government that is already struggling to make much higher Social Security and Medicare payments. Now, let's return to our example individual investor. By the 20th year with flat rates, they are earning $3.43 per year in interest. Of that, $2.25 is the interest on their original $100 investment, and $1.18 is interest on their previous interest earnings. 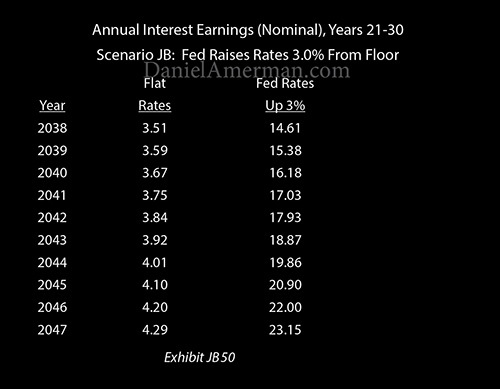 With 3% higher interest rates, they would be earning $13.88 in interest in that 20th year, of which $5.25 is the interest on their original $100 investment, and $8.63 is interest on their prior interest earnings. That is more than $10 per year greater than the earnings at a 2.25% compounded rate, and produces a little more than 4X the annual earnings. So with 2.25% interest rates, compound interest is still fairly weak even after 20 years, and has only reached 52% of simple interest ($1.18/$2.25 = 52%). With 3% higher interest rates, compound interest is much more powerful in 20 years, and interest on interest earnings is equal to 164% of simple interest ($8.63/$5.25 = 164%). At a 2.25% rate - wealth creation is sputtering along, with very slow annual increases in earnings. At a 5.25% rate, a wealth building machine has kicked into gear, and the earnings from compound interest are becoming much more important than the return on our original investment amount. When we look at the nation as a whole, the years from 2028 to 2037 are expected to be a time of steadily higher budget deficits, as the maximum number of Boomers reach retirement age and are claiming Social Security, even as Medicare expenses ratchet upwards with all the still living Boomers aging together in retirement. So long as rates are flat and the government is paying an average interest rate of about 2.25% on its debt - in other words, so long as the compounding of interest is just sputtering along at a low rate - then there is a steady increase in the deficits, and they reach $1.8 trillion per by year 20, even in inflation-adjusted dollars. 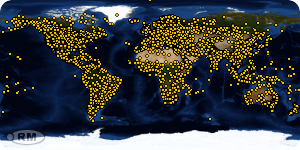 This is an increase of $646 billion from 2028, and an increase of just over a trillion dollars a year from 2018. 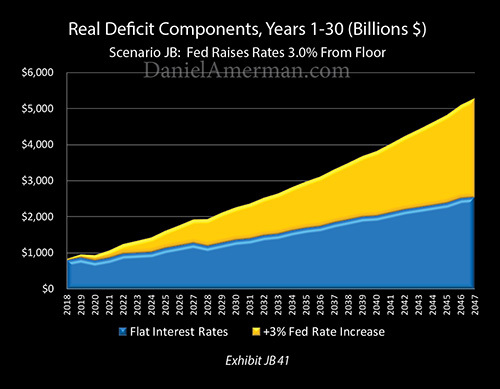 When we have a compound interest engine revved up and feeding the deficits and the debt however - which is what a 3% increase in interest rates does - then the inflation-adjusted annual deficit is up to over $2 trillion per year by 2029, and over $3 trillion per year by 2036. Our annual deficit by 2037 is now over $2.5 trillion greater than it is in 2018. Another way of phrasing this is that the exact same 3% increase in interest rates that produces a 4X increase in annual earnings for investors by year 20, will also result in an increase in annual government deficits that is about 2.5X larger than what the increase would be without the higher interest rates. Returning to our original saver, the whole idea behind building wealth with compound interest is to let time do your work for you. Start early, let the compound interest earnings take over, and let wealth be built for you at a pace that eventually far outstrips the actual dollars that you save. With the very low interest rates that the Federal Reserve forced in the years after the 2008 financial crisis - time helps, but we still don't have a real wealth building machine. Total interest earnings continue to steadily climb at a low rate, and in the 30th year, interest earnings are up to $4.29 per year. Of that total, $2.25 is the simple 2.25% interest on the original $100 investment, and $2.04 is the interest on interest earnings. So even after 30 years - our compound interest is still less than the interest on our original investment. The wealth building "miracle" has been crippled - for the savers of an entire nation, and over a period of decades. Indeed, this has been the largest cost of the financial crisis for the nation over the last ten years. It isn't so much the direct cost of the crisis, which is far in the past at this point, but the costs of containing the crisis. The "miracle" of compound interest has been taken away from the savers of the entire nation, it was sacrificed in the name of financial stability. If the Federal Reserve allows 3% higher interest rates to return, then there is the rebirth of a "miracle" for the nation, as the real power of compound interest reappears after a long absence. With a 5.25% interest rate, our interest earnings in the 30th year are up to $23.15. This is $18.86 more than our earnings with a 2.25% interest rate, and total earnings are 5.4X greater than they are with the lower rate. Of that $23.15 in total interest earnings, $5.25 is the interest on our original investment, and $17.90 is the interest on previous interest earnings. Our money is now fully working for us instead of our working for our money, and the compound interest is dwarfing the annual earnings from our original investment. The graph above has the dry title of "Annual Interest Earnings (Nominal)" but a better name might be "The Return Of The Miracle". 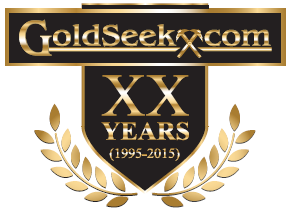 How compound interest builds wealth - and what has been missing in the last ten years - is boldly obvious in the growth and size of the gold area. The above is how wealth is created, and it is the rising curve of accelerating wealth creation that is reason for the quotes from Einstein and Buffett about compound interest. But if the rates aren't there - the fuel isn't there, and neither is the miracle. The blue area shows what happens if the last ten years and the present continue to repeat themselves. With all the gold area becoming lost opportunity, and wealth that could have been there for all the savers of the entire nation - but is not. For the United States government, however, there is a steep and financially deadly price for "The Return Of The Miracle". Because of the long term expenses of Social Security and Medicare, deficits are expected to continue their path of steady increases. So long as federal borrowing rates are low enough that compound interest just kind of sputters along, never really kicking into gear, then the annual growth in the deficits is quite restrained, as can be seen in the "Flat Rates" column. Over 30 years, annual deficits in inflation-adjusted terms would grow from $798 billion in 2018 to $2.546 trillion in 2047. That is bad and it is getting steadily worse, but as shown in more detail in the Part 1 analysis, the economy is also growing and so are tax revenues. So there is a long process of a slow deterioration that never flashes out of control as a direct result of the rising curve of compound interest. What happens if rising deficits meet the real power of compound interest can be seen in the "Fed Rates Up 3%" column. Deficits are now soaring upwards at a much faster rate (albeit not in a straight up exponential curve, because changes in Social Security and Medicare expenses are simultaneously impacting the deficits). Inflation-adjusted deficits are now up to a staggering $5.3 trillion per year by 2047. This is more than twice the level of annual deficits than would be seen with flat interest rates, and represents a $4.5 trillion a year increase from 2018. The above graphic could just as easily be titled "The Deadly Cost Of The Return Of The Miracle". 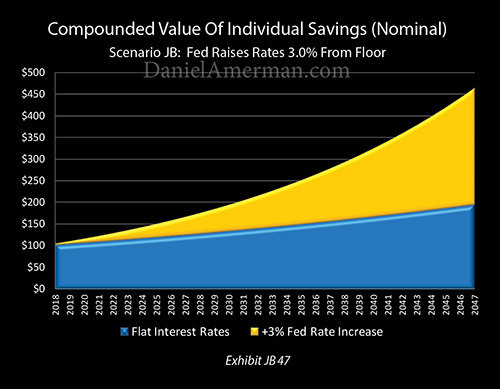 Whether we are looking at personal savings or national deficits, there are only two scenarios here, the blue area of the "JA" scenario of "Flat Interest Rates", and the gold area of the "JB" scenario of "+3% Fed Rate Increase". 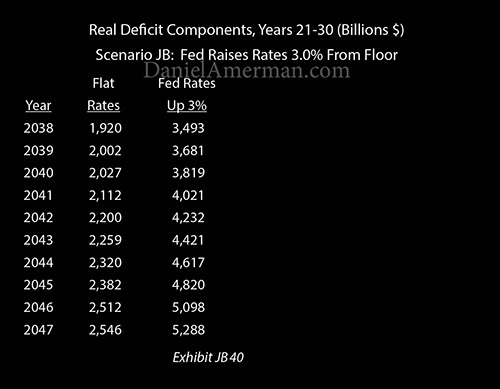 All are part of the same macroeconomic model and the sole difference between the two scenarios is an interest rate increase of 3% that was input for the "JB" scenario. The surge in the gold area in the personal savings graph directly translates into the rapid growth in the gold area of real government deficits. It is the same change in rates and the same mathematical process (albeit in nominal vs inflation-adjusted dollars). Creating a wealth building machine for individual savers of the type that existed for decades before the financial crisis - creates a financial destruction machine for a federal government that is far more heavily indebted than it used to be and must borrow to make all its interest payments, even as the time of far higher Social Security and Medicare payments is rapidly approaching. We have been focusing on interest earnings and deficits, but it is also important to consider the totals over time. If we are looking at the compounded value of our total savings, including the initial $100 investment, then we get the graph above. The radical difference in wealth building with the gold area of +3% interest rates is plainly obvious, when compared to the the blue area of flat interest rates. 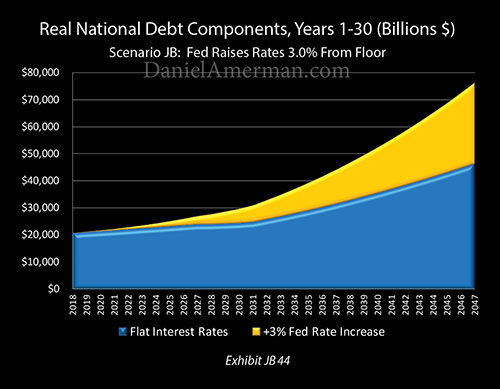 The graph above shows the national debt in inflation-adjusted terms, and again, the sole difference between the blue area and the gold area is the 3% increase in interest costs, all other factors are identical. So the exact same increase in rates that produces the surging gold area of individual savings also produces the surging gold area of a rapidly increasing national debt. Even with flat interest rates, the inflation-adjusted national debt would be $46 trillion in 2047, more than twice its current level. 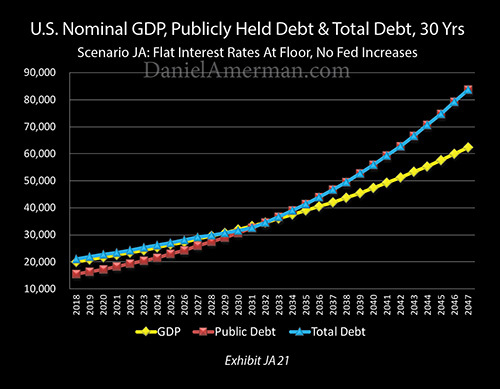 Just changing that one variable of the interest rate paid on the debt is enough to increase that national debt by $30 trillion to a stunning $76 trillion, which is getting close to 4X the current level. If we look at the difference in nominal terms, with a dollar just being a dollar, then with flat rates the national debt would be about $84 trillion in 30 years. That is the path we are going down anyway. 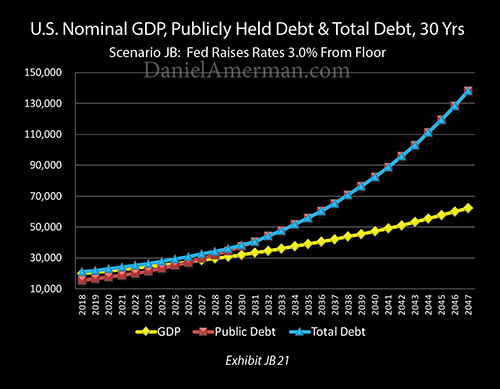 If the Fed increases rates by a full 3% from the floor and keeps them there, however, then the national debt would grow to $138 trillion, which is an increase of $54 trillion. The cost to the nation of the return of the compound interest "miracle" for all the savers is an additional $54 trillion in national debt, over and above the $84 trillion that it would be without higher interest rates. This analysis and the related series of analyses are all based on a somewhat unusual perspective - there is only one world, and our savings and all of our investments exist in the same world as the national debt and in the same world as Social Security and Medicare. That said, many common approaches to financial and retirement planning are implicitly based on there being two or more worlds. In one world there is this huge national debt and expensive promises, and perhaps the choice that most make is to just try not to think about such unpleasant topics. At the same time and (implicitly) in another world, one of the foundations of financial education and literacy is to understand compound interest. Compound interest is why we start early and urge others to start early, because it is the reliable engine that drives the creation of wealth. The reality, however, is that engine has not been working for the last ten years, or at least not when it comes to interest rates on high grade investments. And the reality of the national debt is that we may not see the return of the historical ability of compound interest to build wealth for many years or decades to come. 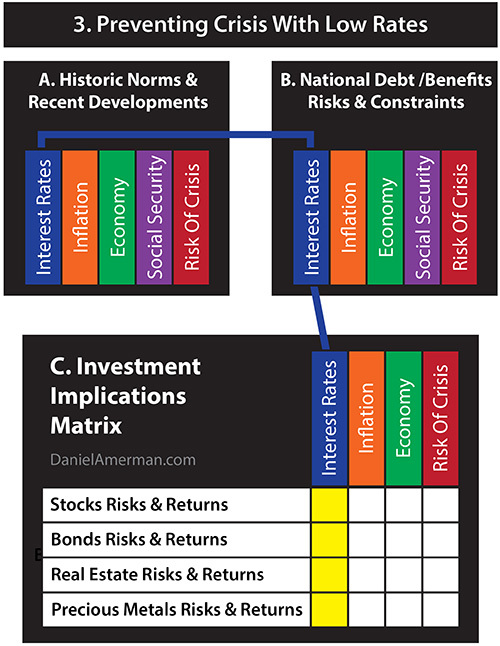 As shown in the "Investment Implications Matrix" above, when we start with recent developments with interest rates (the "A" section), and take into account the risks and constraints associated with the national debt and future benefit payments (the B" section), we get different results for all the major investment categories (the matrix, or "C" section). What we specifically examined was the yellow matrix cell that is the intersection of "Interest Rates" and "Bonds Risks & Returns". However, that is only part of the story - a long term return to interest rates that are much lower than historically average also has critical implications for the long-term performance of stocks, real estate and precious metals, as explored in the analysis linked here. All else being equal, a heavily indebted nation needs lower interest rates. The typical personal impact of what the nation needs is that individual savers and investors create less wealth - possibly much less wealth - and therefore, they have less cash available in retirement, and a lower standard of living than would otherwise be the case. The connection is direct. National needs can drive individual outcomes. This is also true of inflation and it is also true when it comes to the purchasing power of Social Security benefits net of Medicare premiums. The impact on personal financial situations can be radical, as explored in this analysis. One hundred dollars invested at 2.25% will generate $95 in interest earnings over 30 years. One hundred dollars invested at 5.25% will generate $364 in interest earnings over 30 years. The difference between $95 and $364 (or between $950,000 and $3,640,000) can be life changing, when it comes to both financial security and standard of living in retirement. If we are to base our financial security and our future standard of living on the return of a "miracle" from our collective past - then we had better be darn sure that the "miracle" is going to return. And if we think the "miracle" is in fact not likely to work in the future like it did in the past - then we may need to rethink the foundations of our planning, and this could be true for all of our investments. This analysis contains the ideas and opinions of the author. It is a conceptual and educational exploration of financial and general economic principles. As with any financial discussion of the future, there cannot be any absolute certainty. While the sources of information and the calculations are believed to be accurate, this is not guaranteed to be true. This educational overview is not intended to be used for trading purposes, those making investment decisions should do their own research and come to their own independent conclusions. This analysis does not constitute specific investment, legal, tax or any other form of professional advice. If specific advice is needed, it should be sought from an appropriate professional. Any liability, responsibility or warranty for the results of the application of the information contained in the analysis, either directly or indirectly, are expressly disclaimed by the author.